Cultivating Daily unto the Nations: @AnnVoskamp shares her mother’s heart upon her oldest son’s leaving & returning from international missions. Ann Voskamp, author of One Thousand Gifts and blogger extraordinaire on aHolyExperience.com, recently wrote her heart onto page regarding her oldest son’s first international mission service experience. He left. She prayed. Little bit of worry. He returned. She shared her reflections the whole way through. In the context of cultivating daily unto the nations, I thought this was worth sharing. Worth sharing for anyone learning grace and love and service. Worth sharing for any mom and dad facing the notion now or later of “letting go and letting God” have your kids, and worth sharing for anyone encouraging those who serve internationally. Hoping these three blog posts will encourage you as we cultivate the near love of Jesus by going near to the nations. I know there are no guarantees that anyone comes home again. I know sometimes what messes our life up most — is the expectation of what our life is supposed to look like. Entitlement can leave you feeling entirely empty. I know the He only means everything to reshape us and nothing to reduce us. “Just…” I reach over to pick up his bag at the top of the escalator and I don’t know how to say this or why it even matters because he’s just come home from a mission’s trip and his eyes are all lit and he can’t stop smiling. He’s hardly the prodigal but I want to kill the fattened calf and celebrate the miracle of return and how do I make sure he always knows? Who, if you knew their whole story, wouldn’t you love? He nods and forget wondering if maybe someday, some son will be a prodigal. Forget wondering if someday some prodigal son will come home again. I’ve been the Wayward Prodigal Parent. Prodigal in the negative sense. The wasteful one. Irresponsible in my spending. The Prodigal Parent who’s extravagantly wasted too many gold moments, too much priceless time, too much of my spiritual inheritance on the blinking and the shiny and the fleeting. He takes his bag from my hand and I have no idea how his shoulders got so broad. We only inherit so much time. How do you live so that when your kids think of the Grace of the Gospel, they think of you? That’s the crux of the thing: By being the Wholehearted Prodigal Parent. Prodigal in the positive sense. The lavish one. Extravagantly, sacrificially abundant in my giving. The Prodigal Parent who extravagantly loves, recklessly spending on sacrifice. The Prodigal Parent who wastes time waiting up, listening for, praying long. 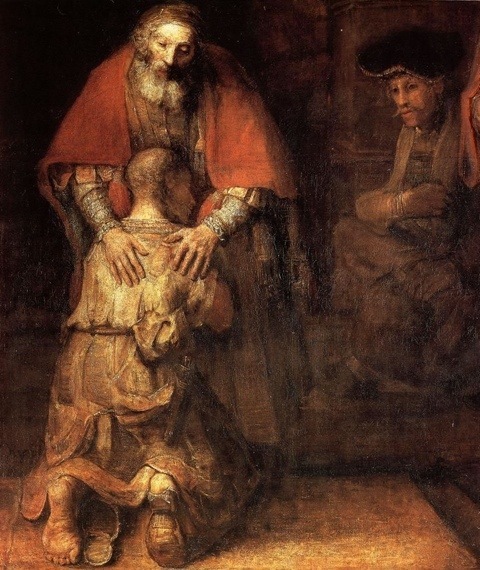 The Prodigal Parent who lives this lavish mercy, this opulent, offensive grace. I look over at my boy come home. Why hadn’t someone told me that parenting was less about avoiding prodigals but more about becoming a better Prodigal parent? You can read Ann’s entire post by CLICKING HERE. Thanks, Ann, for blessing us with your gracious heart and practical thoughts of living out a Father’s love as we cultivate daily.